The Leopard Tortoise is a large and beautiful tortoise; undeniably a true wonder of its kind. This particular species are the fourth largest in the family of tortoises. 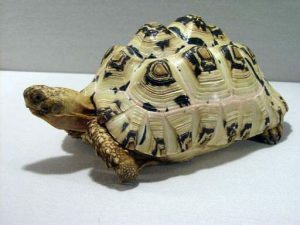 The shell pattern of these tortoises is not only attractive, but it also plays the role of a perfect camouflage in the environment of its home range. These shy creatures retreat into the comfort of its shell on sensing any form of danger or disturbance. These strict herbivores prefer semi-arid, thorny and grassland habitats. 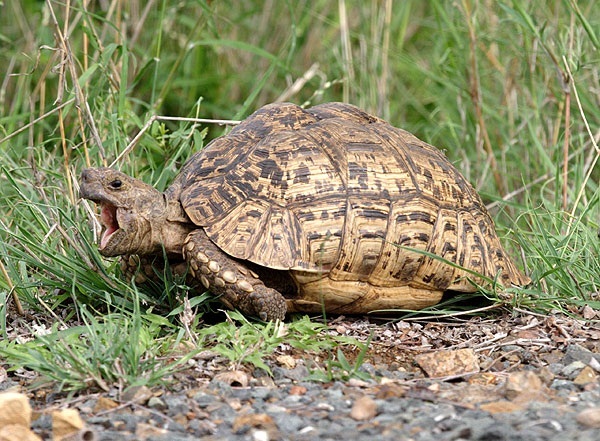 Characteristic of a tropical tortoise, the leopard tortoise also do not hibernate. This particular species of tortoises are ranked to be the fourth largest amidst tortoises. Size: As such they can attain a size of almost 18 inches or 460 mm when adults. They weigh approximately around 18 kilograms or 40 pounds, at this size. There are exceptional cases where certain tortoises have acquired a size of more than 28 inches or 70 centimeters complimenting a weight of 120 pounds or 54 kilograms. In fact the shell of an adult tortoise can even acquire a maximum length of up to 610 mm or 24 inches diametrically. There are certain rare cases where giant Ethiopian form of these tortoises has been noted attain a size of 100 centimeters or 39 inches. Shell: The outer shell or the carapace is shaped like a dome. It has several pyramid-like scutes that are further adorned with attractive patterns. The most interesting part is that each tortoise has a unique and special pattern. Color: The base color of the shell is generally cream or sometimes a pale yellow. It is adorned with an array of patterns that could include spots, stripes, dashes or blotches in black. 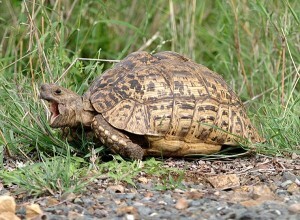 The leopard tortoise feeds on different kinds of grasses, flowers and weeds. A major portion of these herbivores species comprises of fibrous hay and grasses. These tortoises do not drink much water as it extracts the water requirements from the food it consumes. These tortoises are found in the hot and dry savannas with sparse vegetation. They prefer semi- arid to grassland habitats, characteristic of grazing species. These reptiles are often spotted in shady areas or underneath brushy plants in an attempt to escape the scorching heat. However some of these tortoises also inhabit rainy areas. Abandoned anteater, fox or jackal holes often serve as a dwelling during extreme weather conditions for these tortoises. Leopard tortoises are native to the hot, dry scrubland regions of southern Africa, starting from Sudan right to the southern Cape. In the wild, these tortoises begin mating by the age of 12 to 15 years. Male courtships are characterized by the male ramming down the female. These male leopard tortoises also produce grunting sounds during the course of mating. After the mating season is over, female tortoises start laying eggs. Each clutch will comprise of five to eighteen eggs. In captivity, it has been observed that these animals tend to mature faster; sometimes by the age of six. However in the case of South African leopard tortoises, the propagation of these animals is invariably difficult. Leopard tortoise is the only species of genus stigmochelys which has managed to thrive in both cold and hot weather including rainier areas. 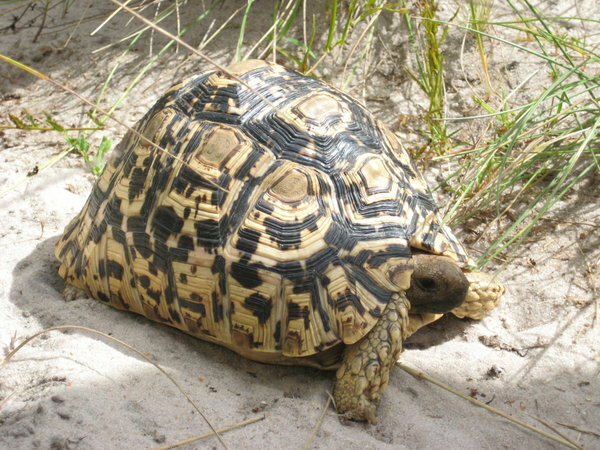 Leopard tortoise are attributed with unique characteristics; it only digs during the time of laying their eggs and can only mate after attaining 10 years of age. Leopard tortoises are confined to their own habitat and they are more defensive rather than offensive. Their body has been specially designed with a feet and head that are completely retratable and their shell provides a complete protection in times of danger. Leopard tortoise can live up to 100 years in the wild! Leopard tortoise is usually found in the African Savannahs and it is one of the largest species of tortoise which can weigh up to 1oo kilograms and can scale up to 70 inches! When it comes to habitat it is solitary creature and is usually engrossed in grazing plants and berries. It is practically impossible for any predator to pose a threat to leopard tortoise because of its hard enormous shell which is impregnable and it provides complete protection to its limbs or any body parts. Leopard tortoise cannot copulate until they attain the age of 10 years and upon completion female leopard tortoise can lay up to 18 eggs which it hides in the ground for protection and incubation. The lifespan of these creatures can stretch up to a period of 100 years. These tortoises have been a delight as lifelong pets to people across the world. Feeding: leopard tortoise is a herbivore and its staple diet consists of green grass of high fibre that is free of pesticide. Grass such as hay timothy or orchard grass is usually preferable including vegetables but on the contrary vegetable with high oxalates such as beet and spinach should be avoided. With proper care and nurturing one can expect leopard tortoise to live up to 50 years and even more. Supplements: Supplements such as calcium and vitamin D3 is recommended and it is better if provided on a daily basis. Outdoor housing is recommended if the temperature is 80-90 f or 27-32 Celsius, as these creatures cannot withstand low temperatures. 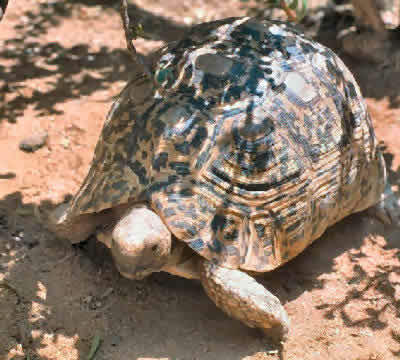 If the temperature is damp or if it drops to 65-75 Fahrenheit at night, one should take note that leopard tortoise is enclosed in large protected area. This area should be a shady area that is free from predators, accessible to pan of drinking water and hiding spots so as to make them feel at home. For indoor housing leopard tortoise will require 4 to 8 feet of enclosure. One can use grass or hay as a perfect substrat.UVA or UVB lamp is required for artificial basking and should have a minimum temperature of 95. There should also be an extended enclosure with the temperature of 80-90 f during day and 65-75 f at night. Do not forget to place a shallow pan of water for your dear pet. The leopard tortoise is not an endangered species. on the positive side it helps in increasing the population as they are more prone to danger due to increasing human population.